Slice potatoes 1/4" thick. Over medium heat, spray 2-3 seconds of cooking spray and add potatoes. 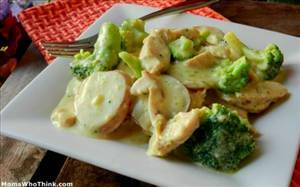 Stir the soup, milk, garlic powder, broccoli and chicken into the skillet. Sprinkle with cheese. Heat to a boil, then reduce the heat to low. Cover and cook for 5 minutes or until the potatoes are fork-tender. Note: based on a Momswhothink recipe. 232 members have added this recipe to their cookbook. This is great and cooks up fast! I like one dish meals and this definitely a keeper. First off, I would like to change this rating from a 5 to a 1,000. WOW to whomever came up with this. Second off, just want to say I added 1 thing: Shallots. Yum. For someone who's ARCH NEMESIS is Broccoli, I loved every smidgen of every bite on my fork AND plate. Thank you, you have cured me of my childhood issues with cooked broccoli and cheese! Will definitely be cooking this again. I realized using a tablespoon of Olive Oil works much better than the spray. I came to close to burning it at first. There are 329 calories in 1 serving of Broccoli Chicken Potato Parmesan. Calorie break-down: 14% fat, 50% carbs, 36% protein.